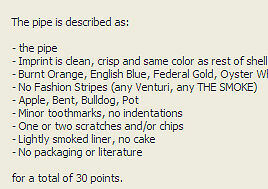 The value of pipe #211 is 30 points. Scott Meyer bought a large lot of pipes on eBay, one of which was this nice pipe. He willingly sold it to me to defray his cost for the lot and so the collection has another specimen. When better examples of the shape/color came my way, this one went to the Pipes for Sale page. The bowl liner appears to be almost unsmoked, either extremely well cleaned or having had only a bowl or two smoked in it. The mouthpiece has only a very few, very light tooth-marks. The paint has only a few extremely small paint chips on one side and the heel of the bowl. George Sackett became another fan of these easy to clean and great smoking pipes and bought this one for his collection.